You’re reading The Ultimate Breakfast Bucket List. 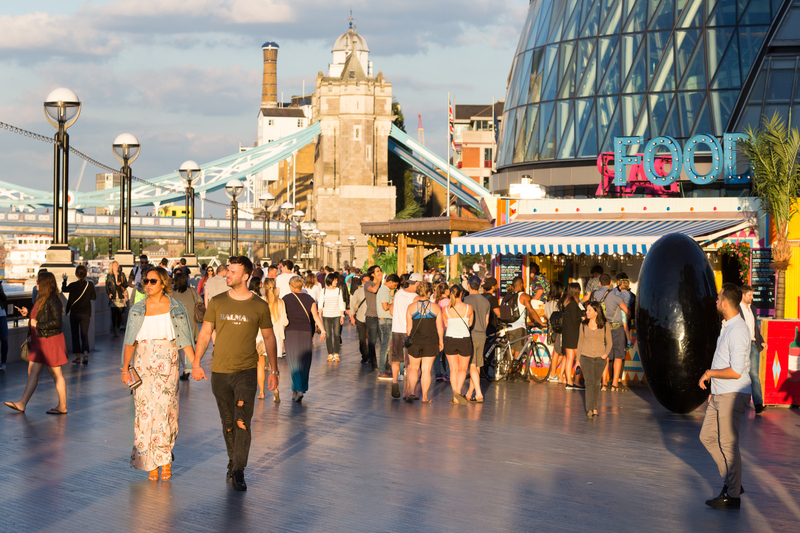 Congratulations – you’ve made the first step towards eating the best eggs and bacon that London has to offer! Serving anything in a skillet pan and offering the option of grilled bone marrow (don’t knock it till you’ve tried it) screams splendour, but the food here is also well sourced and great-tasting. Already hailed (by us) as one of the best fry ups in town, their breakfast for two includes smoked bacon chop, short rib bubble and squeak, meaty grilled bone marrow, trotter baked beans and trademark HP gravy. It’s the mightiest, meatiest brekky there is. The Regency Café opened way back in 1946 and continues to serve proper British grub to this day. The interior is very unpretentious, with basic art deco features and pictures of Tottenham Hotspur players on the walls (sorry Arsenal). What it lacks in fanciful design it sure makes up for with the food. 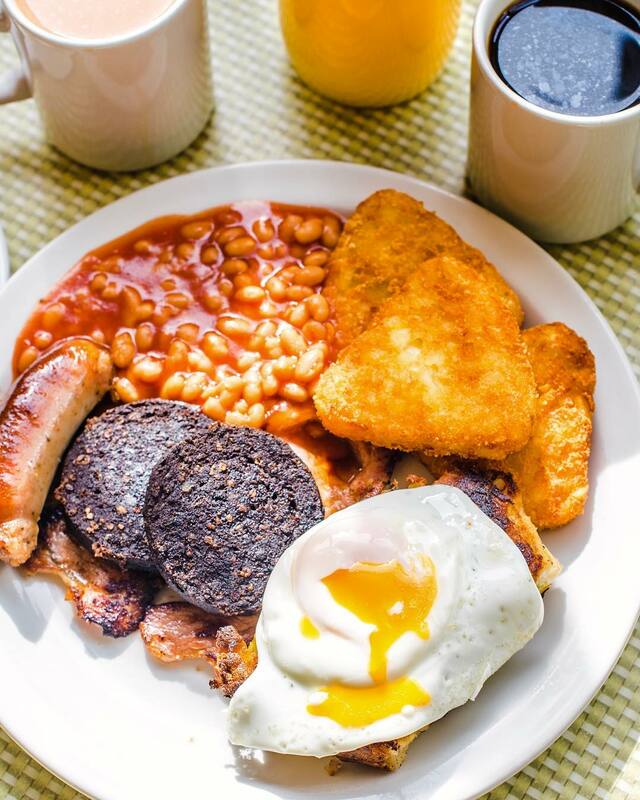 The fry up is a total bargain at £5.50, with the option to add extras (e.g. bubble and squeak, hash browns, black pudding) for an extra 90p. You may have also spotted the café in various films and TV shows, including Layer Cake in 2004. We’ve raved about this one a few times and, trust me, there’s a reason for it. Light puffy naan bread surrounds layers of crispy sugar-cured bacon, melted cream cheese, coriander and chilli tomato jam. 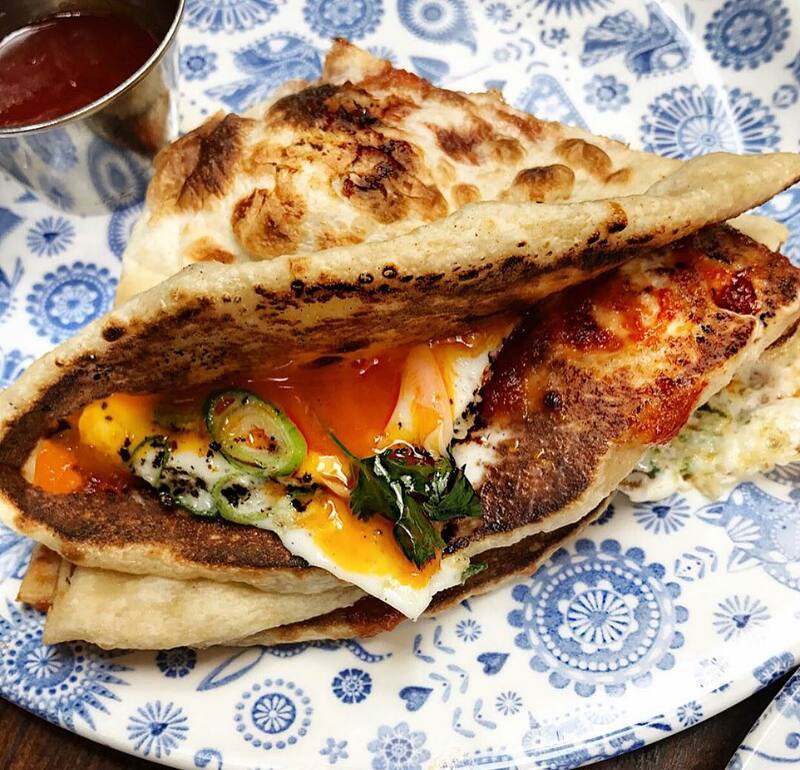 The Dishoom bacon naan laughs in the face of the British bacon buttie. 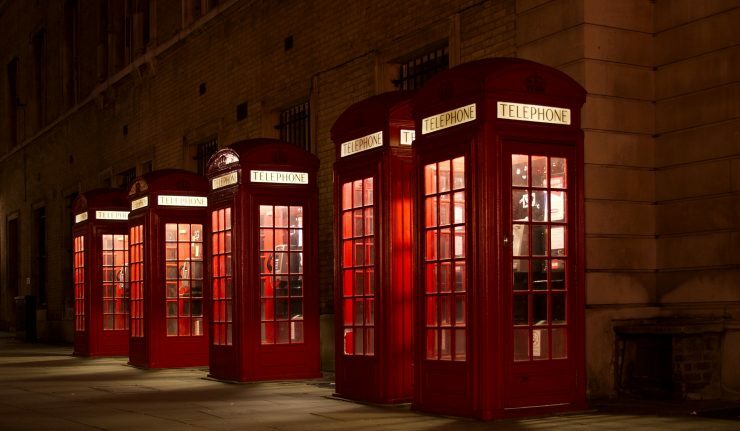 In fact, we’d go as far as saying you can’t call yourself a Londoner until you’ve tried one. 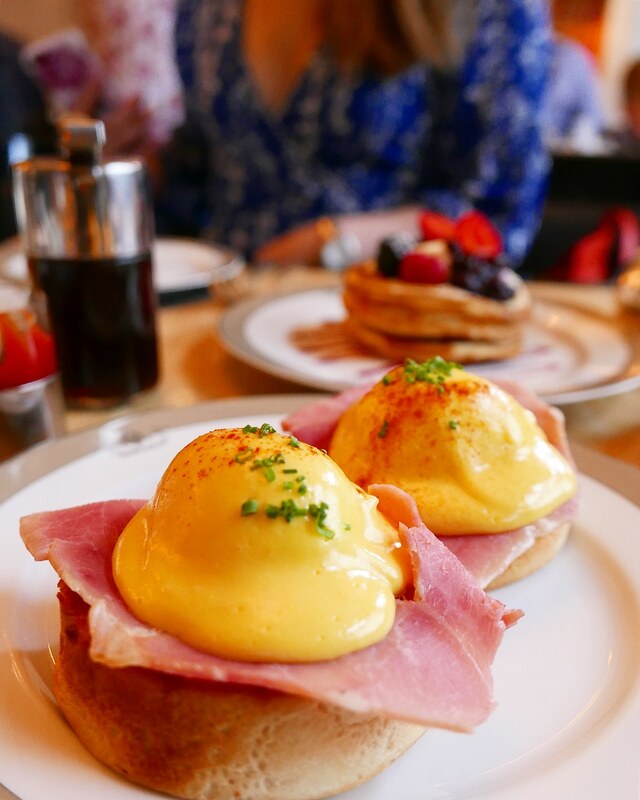 Don’t be put off by the celebrity clientele; you don’t have to be rolling in it to breakfast like a king at The Wolseley, The restaurant is famous for having the best Eggs Ben in London and, at £7.50 a plate, it’s hardly got a Mayfair price tag. If you do feel like splashing out, mind, there is a luxurious caviar omelette on the menu for £70. Guess what? There’s eggs on the menu at Eggbreak. And when we say eggs, we don’t just mean the ‘done any way’ kind. 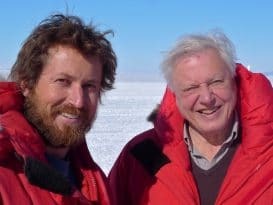 We mean done every way: ways that you didn’t even know were possible. 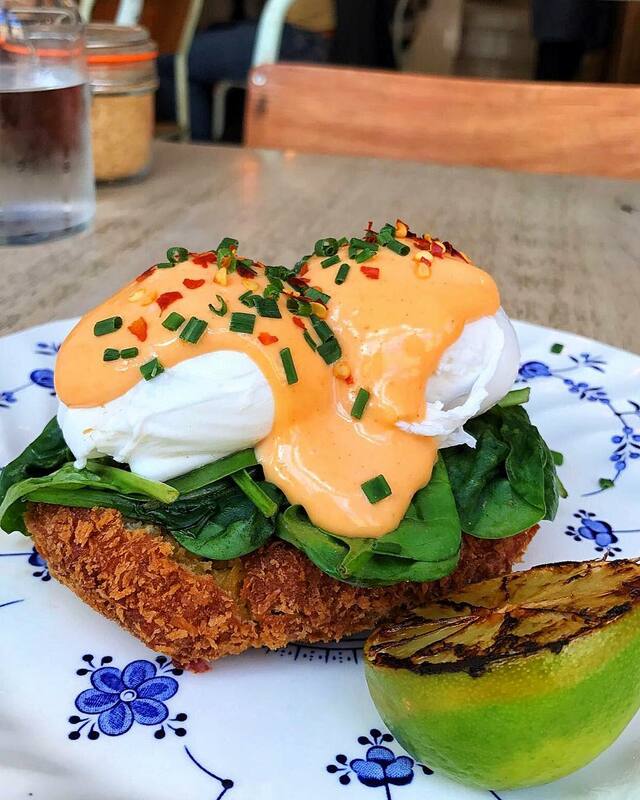 Try the Crab Cake Benedict with Sriracha hollandaise if you’re after something different and downright delicious, or opt for their Sweet Potato Rosti with goat’s cheese, honey, kale, pine nuts, dill yoghurt and poached egg. It really is an eggcellent place to start the day. 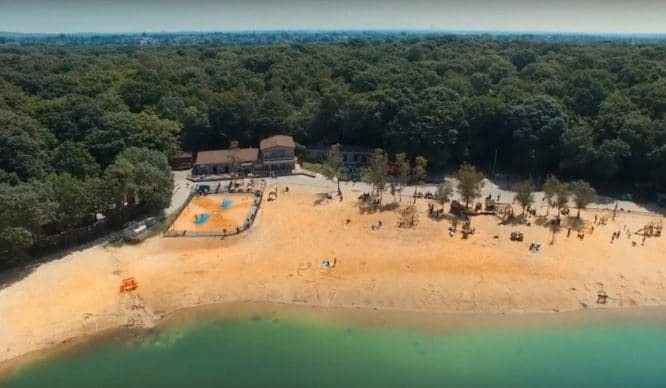 Terry’s Café is family run and the food is all top quality and locally sourced. The meats they use are from Smithfield Market – where Terry worked before opening the café – and their fresh produce comes from Borough Market. They stick to a traditional breakfast of sausage, egg, bacon, bubble and squeak, black pudding, beans, tomatoes and mushrooms. It’s damn good. No breakfast round-up is complete without a mention of Caravan and their baked eggs with tomato pepper ragout, greek yoghurt, toast and merguez sausage. It’s easily one of our favourite places for early morning feasting. If you haven’t been here yet, you seriously need to ask yourself what you’ve been doing with your Sunday mornings. 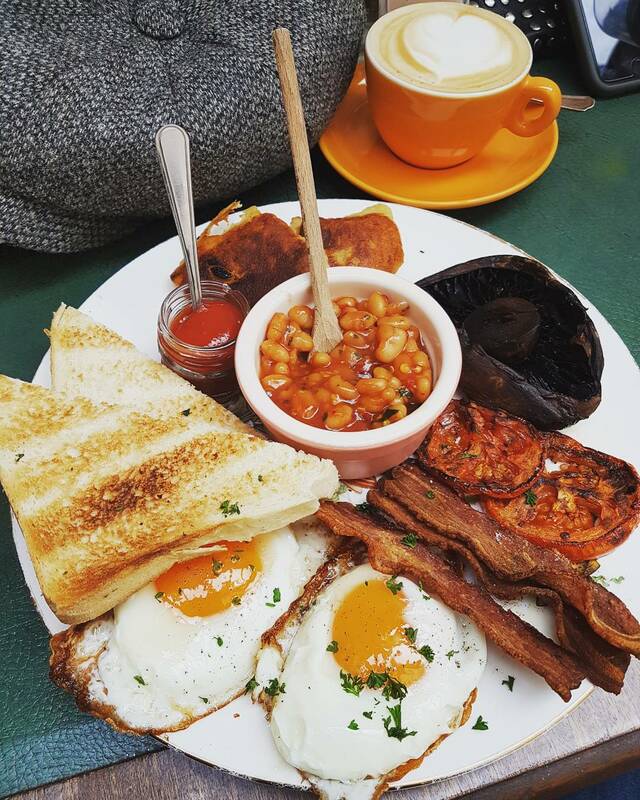 The Pedler Breakfast consists of eggs, Cumberland sausage, valley smokehouse bacon, house-made beans, black pudding, flat mushroom, slow roast tomato, toast and maple salted butter (yes, maple salted butter)! See, the menu has your mouth watering before you’ve even arrived. Ricotta Hotcakes at Granger & Co.
Granger and Co. make their ricotta hotcakes (that’s pancakes to you and I) thick and fluffy, with a texture as light as heavenly clouds. They’re served with banana and honeycomb butter, giving you just the right amount of sugary sweet energy to start your day. 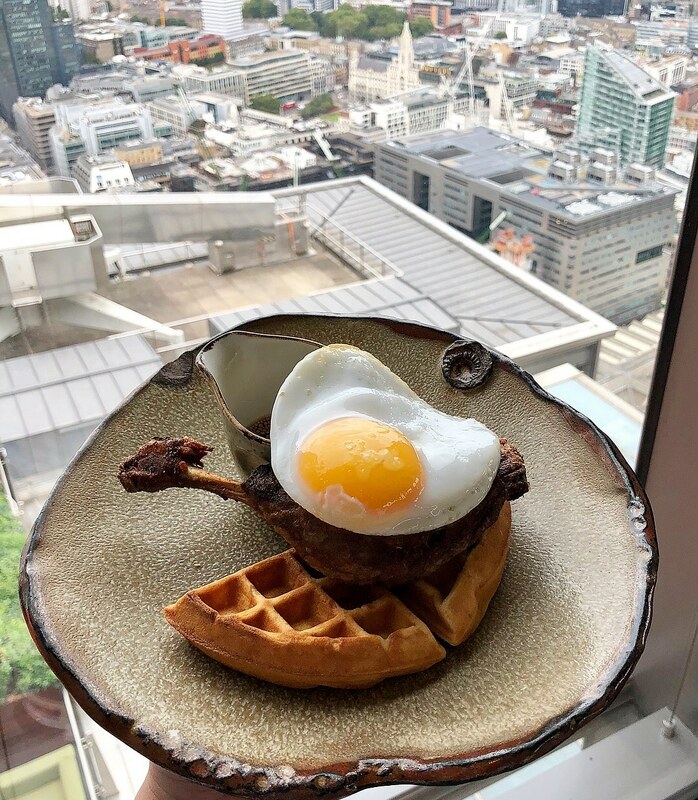 If you’ve not yet made your way up the Heron Tower for brekky, you must get Duck and Waffle‘s signature dish when you do. The combination of crispy confit of duck leg and a fried duck egg, both served on a crisp yet fluffy waffle, is surprisingly delightful. It’s topped with a tangy mustardy maple syrup for the perfect amount of sweetness alongside the savoury. It’s not the cheapest of breakfasts, but for £15 you also get an unbeatable view of the capital. 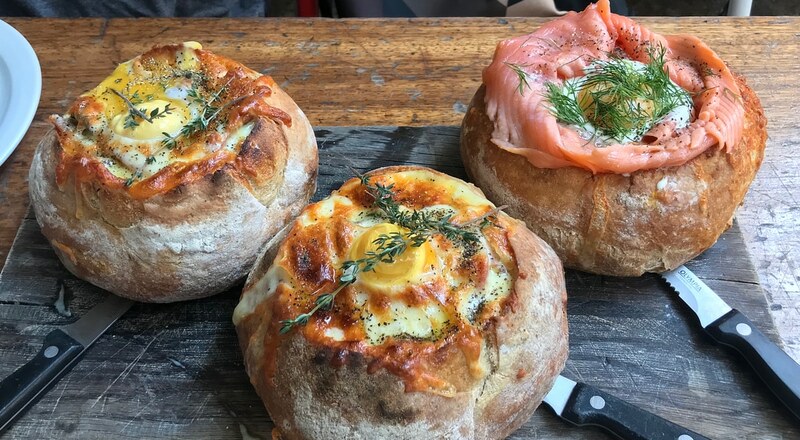 Head to The Barge House over the weekend for their signature Breakfast in Bread. They hollow out an artisan sourdough loaf and fill the void with all your favourite breakfast foods: opt for the Original with smokey bacon, sausage, tomato, leek, mushroom, spinach, egg and cheese; the Smoked Salmon with spinach, leek, salmon, crème fraiche, egg and cheese; or the Hot Stuff with chorizo, spicy beans, red peppers, chilli mushrooms, spinach, egg and cheese. There are also some delicious options for vegans and vegetarians. 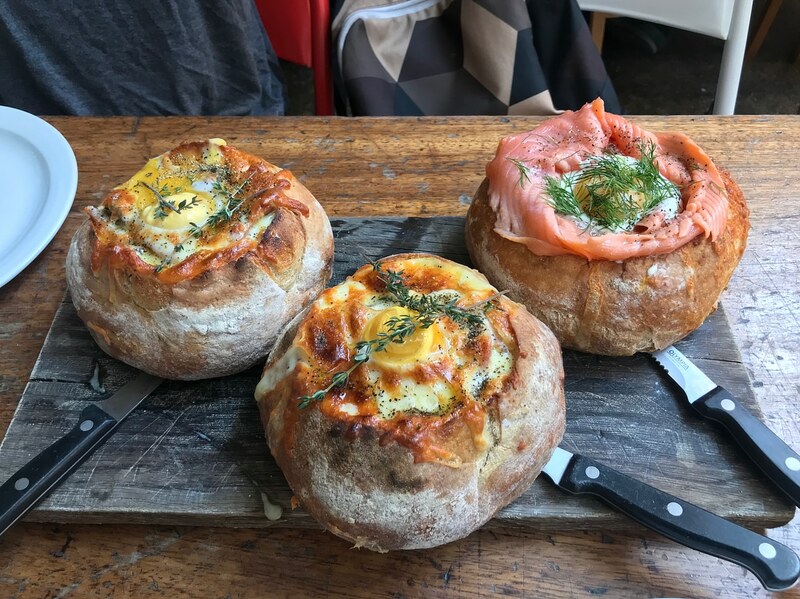 Pair one of these with a Bloody Mary or a freshly squeezed juice and you’ve got yourself a true breakfast of champions. Possibly the most Instagrammable coffee shop in the whole of London, Palm Vaults in Hackney is decorated with pastel colours, retro prints and plenty of plants. Behind the tropical interior, their menu is also super trendy, and is constantly changing. We’re talking matcha frappés, avocado coffees and RED VELVET lattes. Smoking Goat, the critically acclaimed restaurant inspired by Bangkok’s late-night canteens, is renowned for its magnificent evening dishes – but did you know that you can also go for breakfast? 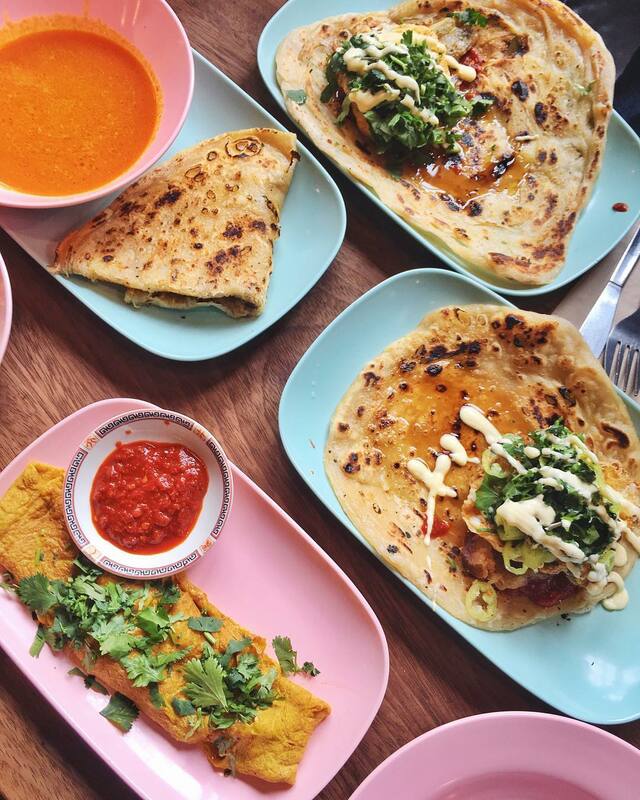 The morning meal, also echoing the breakfasts of Bangkok, is centred around roti, which can either be served with curried saffron eggs, smoked aubergine with egg and chilli, cured Tamworth jowl, or smoked beef sausage. Breakfast is served from Thursday to Sunday, and can be accompanied by Vietnamese coffee or Thai style Bloody Marys. The breakfast menu at Ask for Janice has everything you could ever want: from sweet to savoury, hot to cold. We’d recommend the baked eggs with merguez sausage, roasted peppers and yoghurt – it’s their best dish, IOO. It’s open from 7.30am, and is the perfect place to start your day. Not to mention the gorgeous interiors and the cracking coffee from Coleman Coffee. The Breakfast Club is loved by many, and for good reason. 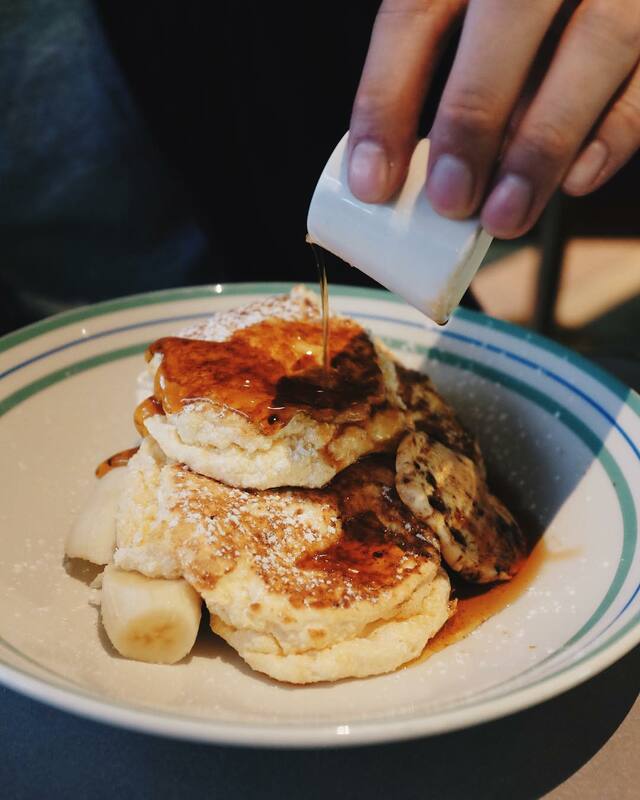 Their piled-high pancake stacks, topped with lick-your-plate-clean maple syrup and vanilla cream should definitely be on your breakfast bucket list. 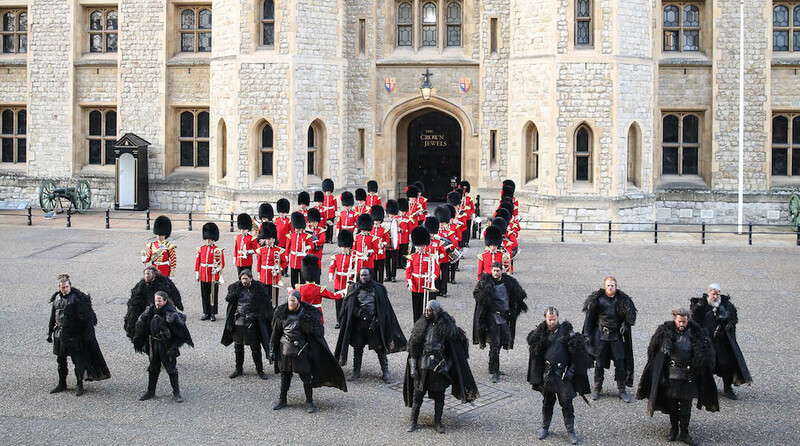 However, if you want to avoid the queues, it’s probably best to find a time during the working week to go. Nothing’s worth getting hangry about. This one is more about the venue than anything else, although the food is still extremely good. 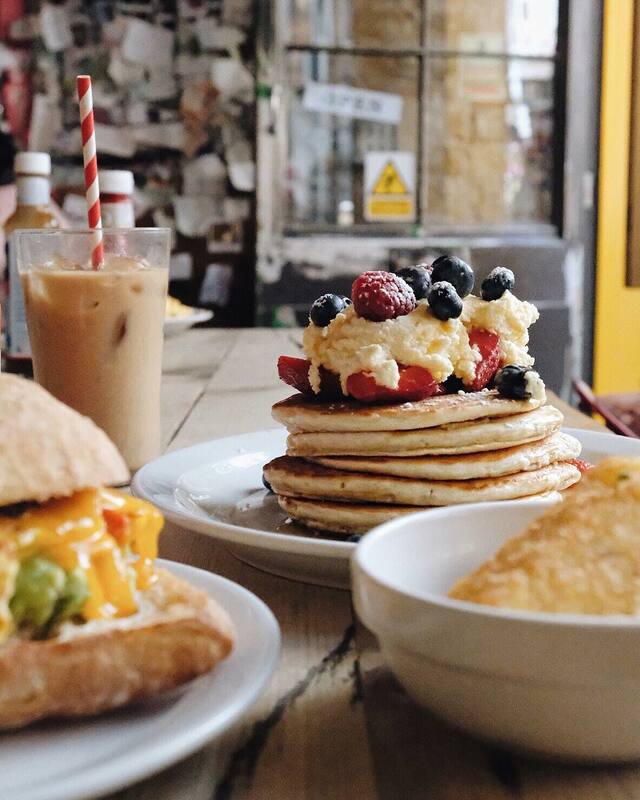 It’s a humble north London café that is disguised as your grandma’s house, and they serve a hip and huge breakfast menu – including sweet and savoury pancakes, bacon butties, French toast, avo’ on toast, and the classic full English. We recommend the Build Your Own Breakfast Bundle with a potato scone, garlic infused kale, tomatoes and poached egg, served with your choice of extra trimmings – streaky bacon, smoked salmon, mushroom, hummus, spicy coriander beans, etc, etc. Read more about it here. Brother Marcus‘ breakfast is out of this world. 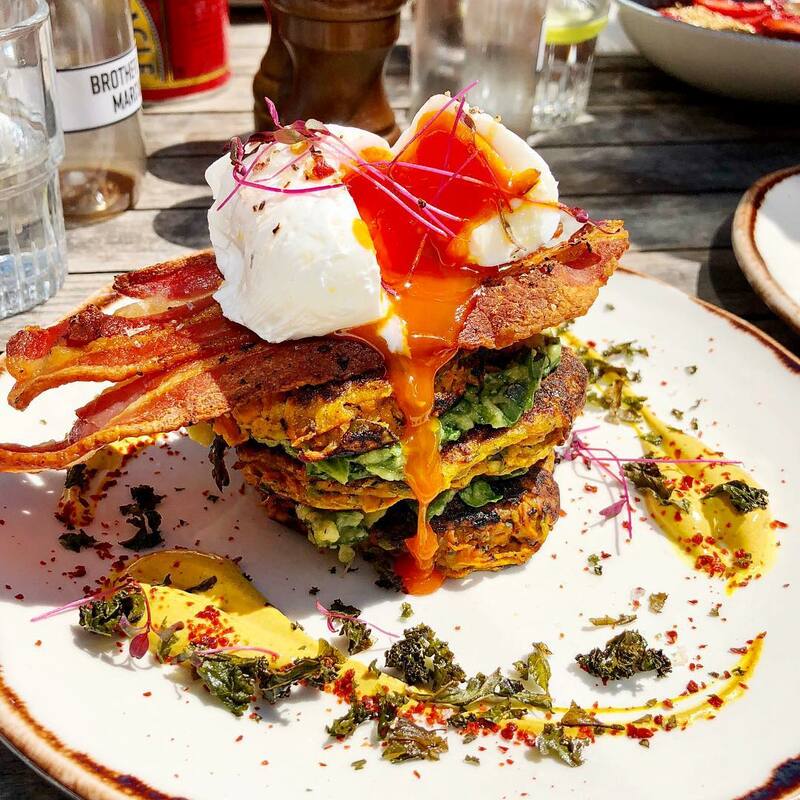 Their menu is filled with weird and wonderful things such as their Step Sister dish: gluten free sweet potato, courgette and feta fritters served with avocado, spinach, kale, turmeric yoghurt and a poached egg (the one pictured has added bacon ?). You should also try the In-Law: a salt beef bagel that will totally blow your mind.